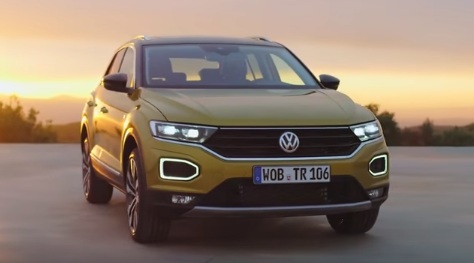 Volkswagen UK presents the 2018 Volkswagen T-Roc in a new advert, aiming to spotlight the SUV’s sporty proportions, expressive design style and dynamic ride characteristics. The 40-second spot features the German automaker’s new compact crossover speeding down a road, while in the background the song “It Feels Good” by Raphael Lake & Royal Baggs is playing. The spot also highlights the Active InfoDisplay (chunky 11.7-inch digital dials) and the central infotainment screen, which comes in a range of sizes up to 8 inches and allows users to add the App Connect smartphone interface. The VW T-Roc also boasts panoramic sunroof, optional 300-watt Beats stereo, and safety features like Front Assist with city emergency braking and lane assist as standard. Its trim levels are called Style, which features silver underbody guard, 17-inch wheels, white ambient lighting, customisable, and a contrasting roof, and Sport, which features 17-inch wheels, black rooflining, sports seats, aluminium pedals, tinted rear windows and lights, red ambient lighting, and red brake calipers. In Europe, the T-Roc is scheduled to go on sale in November, with some early pre-sales in September, for around 20.000 euros. As for the US, according to a Volkswagen spokesperson, the T-Roc will not be available for sale.